Traditionally, Glass Cord is manufactured by the impregnation of glass filament with resorcinol-formaldehyde latex. The latex is cured as the strand is passed through an oven. The strand is then twisted. Several strands can be plied together into a cord. During the rubber moulding process the rubber matrix reacts with the cord to enhance the adhesive bond. There is no bonding between strands – they are simply pulled together. 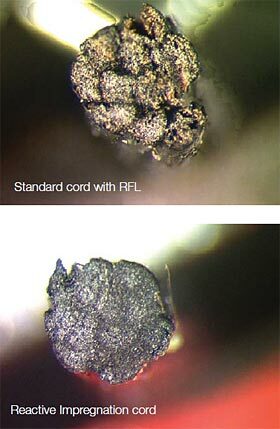 This can lead to weakness within the cord structure and areas of fatigue due to crack formation. Reactive Impregnation technology does not use resorcinol-formaldehyde. Instead, a mixture of reactive chemicals is used. These are dried not cured around each glass filament. When the cord is moulded inside a rubber article, the impregnation inside the cord reacts at the same time as the external rubber. The net result is to create one network throughout the cord of both rubber inside the cord and the bulk rubber matrix. The individual strands are now fully bonded. These new cords give belt designers greater opportunities to overcome the the ever-increasing demands of automotive engines, and to progress the technology of synchronous belts in a cost-effective manner.